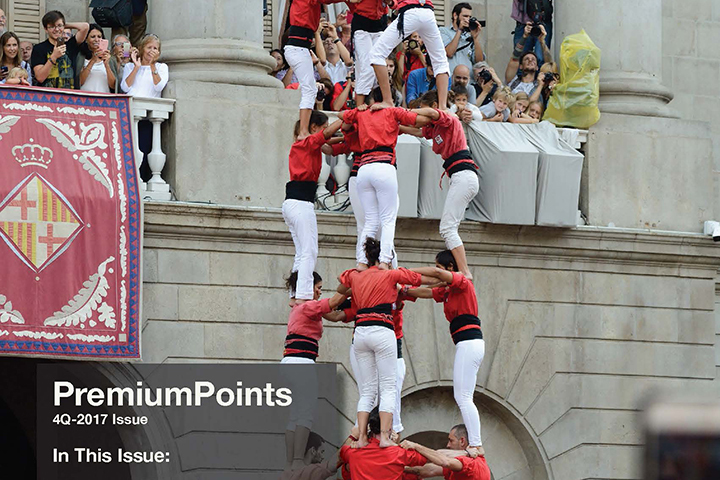 In this issue of our periodic newsletter PremiumPoints: 2017 Review & Outlook, What Volatility?, Account Security & LogIns, CSCM Major Projects in 2017, What Is a Bitcoin Worth? and ETF Update. 2017 is in the books and 2018 is underway, right where 2017 left off…with the global equity markets in levitation mode. The equity markets rallied strongly in 2017, with the U.S. benchmark S&P 500 gaining 22% for the year while the Emerging Markets benchmark gained 37%… great and unsustainable. Crypto-currencies gained visibility with absurd meteoric price gains and an obvious and dangerous mania driving it. Market volatility remained at historic lows. The bull market in stocks is now the second longest in market history and within striking distance of being the longest. Just as record-high volatility of 2009 did not presage the end of (market) days, record-low volatility does not presage perpetual smooth sailing for the markets. A word to all Clothier Springs Capital Management clients: please make sure you have activated your security device and are able to login to your Interactive Brokers account(s). It is important that you are able to administer your own account, transfer funds, download statements and trade confirmations, view holdings and balances and generally oversee our advisory activities on your behalf. Clothier Springs Capital Management was busy this year. We undertook several major projects to maximize our back office efficiency, revamped our website to remain relevant and current, launched a partnership for investment in private market opportunities and formed a new custodial relationship with CamaPlan Self-Directed IRA LLC—a vendor for holding client assets in Self- Directed Individual Retirement Accounts. Crypto-currencies like Bitcoin exploded into the public consciousness in 2017 as astonishing price action grabbed speculator’s attention. With no assets, shareholder equity, revenues, profits or dividends, crypto-currencies have zero intrinsic value and as such are not properly considered investments. ETF.com reports that ETFs continued to take market share from their mutual fund cousins in 2017. Equity mutual funds saw net outflows of $153 billion in 2017 while equity ETFs picked up $348 billion.